Joseph Prosper Dorval, later Desgroseiliers (var. Desgroseilliers) and Charlotte Lunegand (var. Nunegand, Beaurosier) were united in matrimony in St-Joachim Roman Catholic church in Châteauguay, southwest of Montreal. He was almost 29 years old and she 17½. Joseph and Charlotte had thirteen children born between 1773 and 1795: six sons, six daughters, and one child of unrecorded gender. The family made its home first in Châteauguay, and then in Montreal and later in St-Martin (Laval), before finally returning to Châteauguay. Joseph died between 1795 and 1800, while Charlotte survived until May 1835.
opposition, je soussigné desservant la dite Paroisse / ai reçu leur mutual consentement et leur ai donné la / Benediction nuptial en presence de Marie Louise / Desgroseliers, soeur de l’Epoux, de Jacques Doret, / de François [Metate? ], Jean baptiste Doret fils, de Jean / Besse, beaupere de l’Epouse, de Claude Roland, Charlot / la Roche et de plusieurs autres parens et amis. opposition, I undersigned serving the said Parish / have received their mutual consent and have given them the / nuptial Blessing in the presence of Marie Louise / Desgroseliers, sister of the Groom, of Jacques Doret, / of François [Metate? ], Jean baptiste Doret son, of Jean / Besse, stepfather of the Bride, of Claude Roland, Charlot / la Roche and of several other relatives and friends. 1. 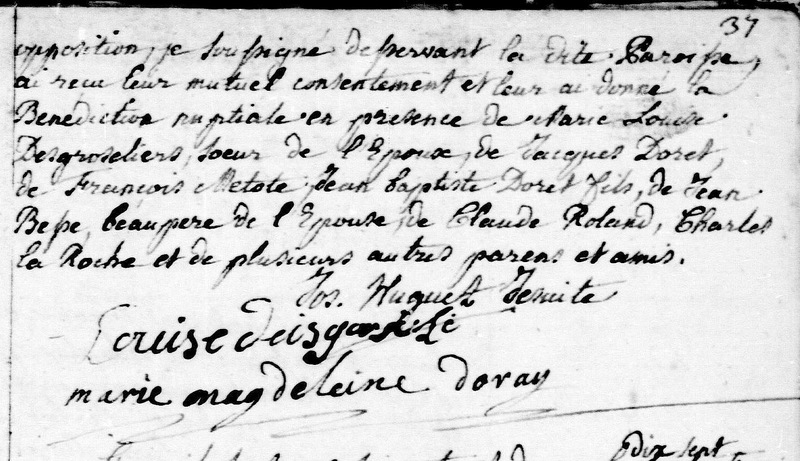 St-Joachim (Châteauguay, Quebec), parish register, 1768-1775, pp. 36-37, no entry no. 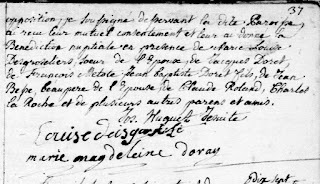 (1772), Joseph Prosper Desgroseliers – Charlotte Nunegand [sic] marriage, 17 February 1772; St-Joachim parish; digital images, “Le LAFRANCE”, Généalogie Québec (http://www.genealogiequebec.com : accessed 30 June 2015). 2. Joseph Cossette, “Huguet, Joseph”, Dictionary of Canadian Biography, vol. 4, University of Toronto/Université Laval, 2003– (http://www.biographi.ca/en/bio/huguet_joseph_4E.html : accessed 16 February 2016).